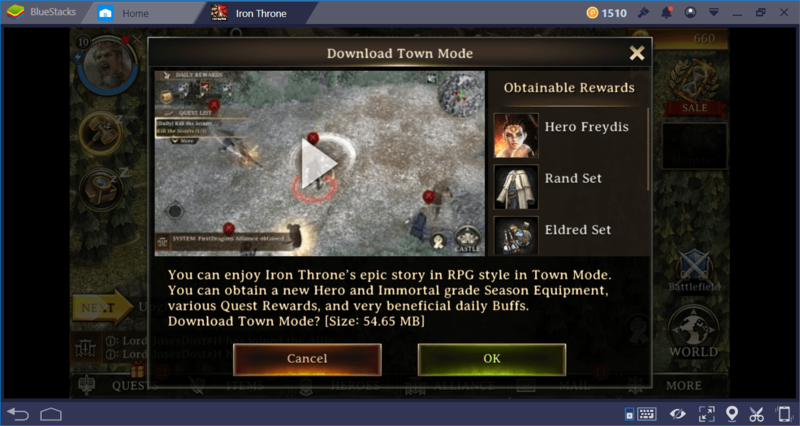 Even the most experienced mobile conquest players can have problems in Iron Throne: The game has lots of new features and you have to play for hours to learn all of them. If you do not want to lose so much time, you can take a look at this guide we have prepared and learn useful tips to improve your kingdom faster. You can win many free rewards especially at the beginning of the game. You will often see ships arrive in the harbor area: If you click on one of these ships, you can get free resources. Likewise, by visiting the Temple building, you can get a specific resource for free every 24 hours. 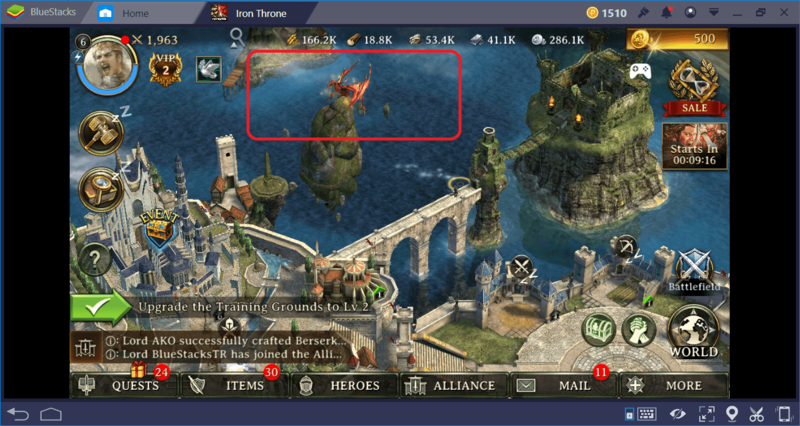 On the northeastern part of the map, you will see a red dragon: You can earn free gold every 24 hours by clicking on it. Finally, remember that you will win many rewards for almost every activity you complete at the beginning of the game. Almost every upgrade will give you lots of resources for free. If you see the “claim your reward” notice in the middle of your screen, there is a free gift waiting for you. Once you reach level 8, you will be asked whether you want to install the town mode. You need to download an additional file of about 60 MB. Town mode is a very interesting feature: Various crimes are committed in your city and you are trying to find the criminal(s) by working like a detective. In addition to being a fun mode, loot boxes are spawned in different parts of the city during this mode. If you can manage to find these boxes and click on them, you can get additional free resources. Iron Throne offers so many unique features, you can miss out on the quests. However, these are the best ways to get awards and level up your heroes. 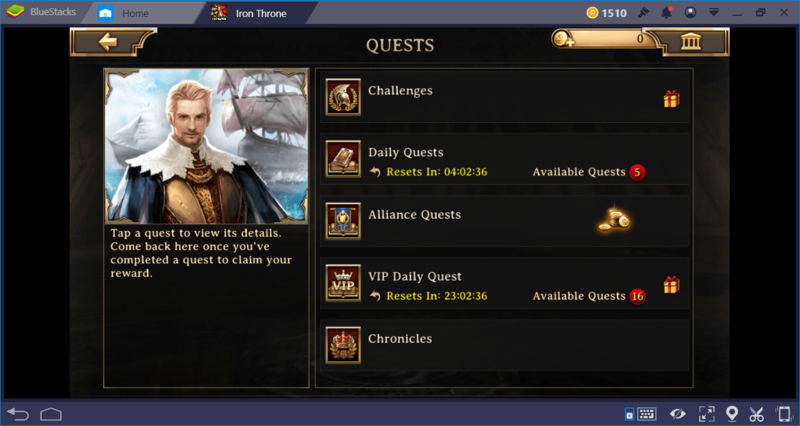 There are three types of quests (Daily – Alliance – VIP) and as you can guess, VIP quests give the most award. Alliance quests also have quite satisfying rewards, but you need to join an Alliance to complete them. It takes a couple minutes to complete the quests and make sure that you are doing all of them each day. You can also complete VIP quests without having to pay with real money: ıt is possible to get VIP benefits for a few hours every 24 hours. However, you have to activate this feature first. Sooner or later, some other player will attack your castle. Your only option to strengthen your defenses is not a big army. By producing traps for your castle walls, you can slow down the enemy army and even damage them. The cost of the traps will increase over time, so try to produce at least a few at the beginning of the game. Once you’ve built them, the traps will provide you a long-term protection. 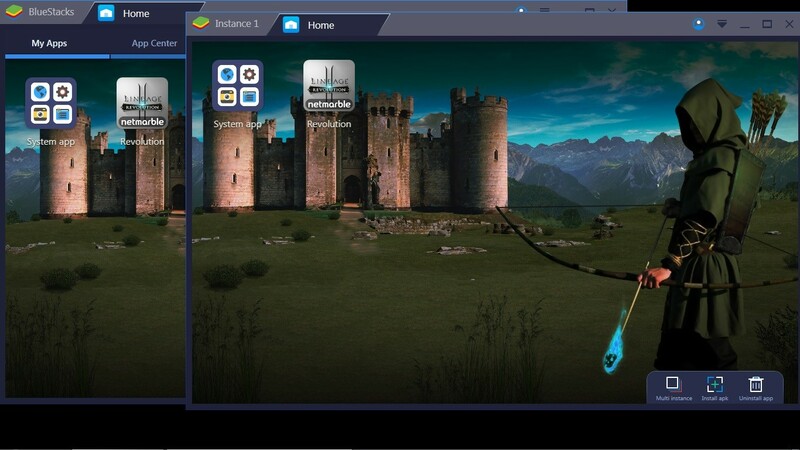 If you are a BlueStacks user, it’s easy to play the game with multiple accounts. Add a secondary Google account from the BlueStacks “Settings” menu using BlueStacks Multi-instance and restart the game. All necessary files will be downloaded once more. 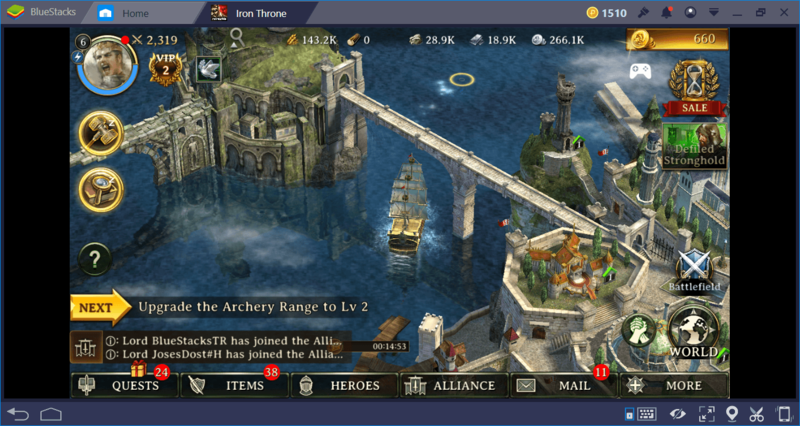 You can play Iron Throne with multiple accounts by switching between these Google accounts on separate BlueStacks instances each time. It is even possible to send resources and troops to yourself. You can theoretically create your own Alliance too. 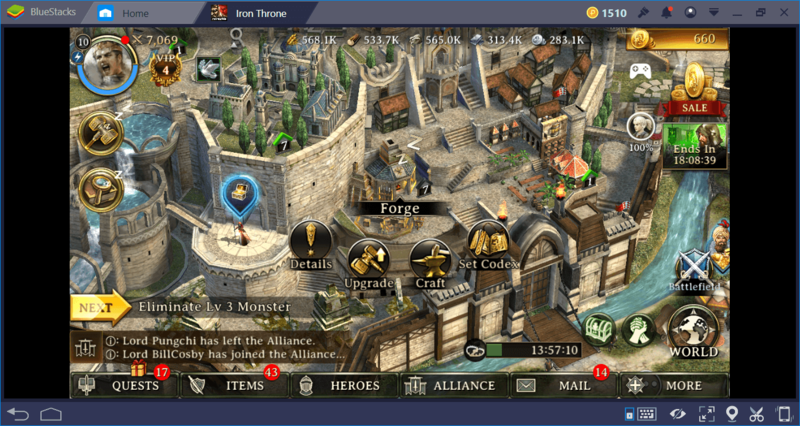 To create an Alliance, you only need 200 gold and you can easily earn that amount. There is one more way to give armor, weapons, and accessory to your heroes: You can make them yourself. You are not limited with items that come from events and quests. You have to use the Forge building to do this. All items and accessories in the game can be manufactured if you have the necessary materials. You can combine multiple materials to get high-level materials to make high-level items. Note that the starting materials will be lost during this process. You can upgrade the Forge building to level 30. The higher the level of the building, the higher the quality of the items you can produce. The Academy building is neglected by most players. 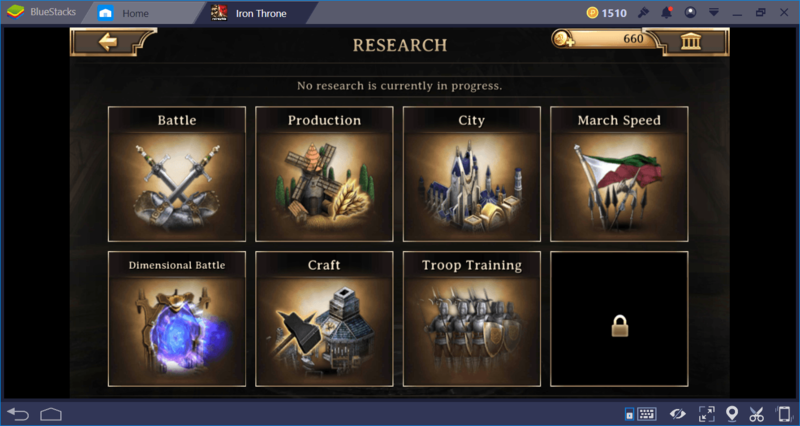 However, it offers a lot of research options that will help you build your kingdom and raise your army much faster. Begin with construction and production speed research. We recommend that you research them both to the highest level. If you do this at the beginning of the game, you will benefit greatly during the late stages: Especially the speed of resource generation and troop raising will increase considerably. You can produce faster than most of your competitors when you need it the most. It’s easy to forget the Watchtower because it’s a bit out of the way and does not attract much attention. However, this tiny building is very important: It allows you to “scout” enemy players. You can learn which units the attacking army is made of. Likewise, you can see what kind of defense your enemy has before attacking and setup your own army accordingly. 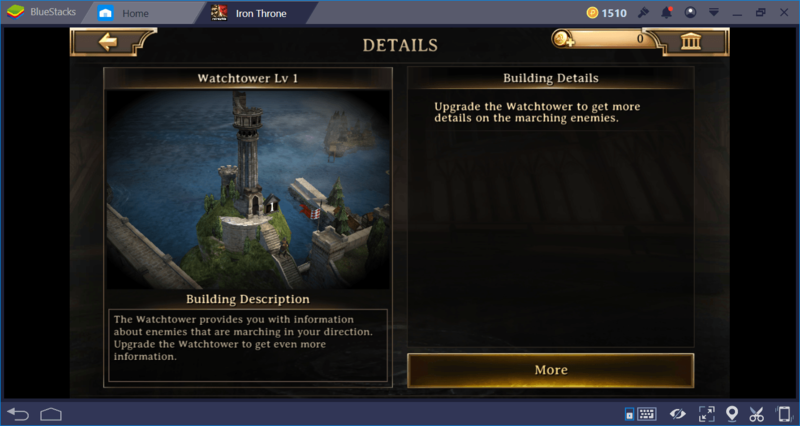 The more you upgrade the Watchtower building, the more detailed information you get. The tips and tricks in this guide will help you every step of the game. 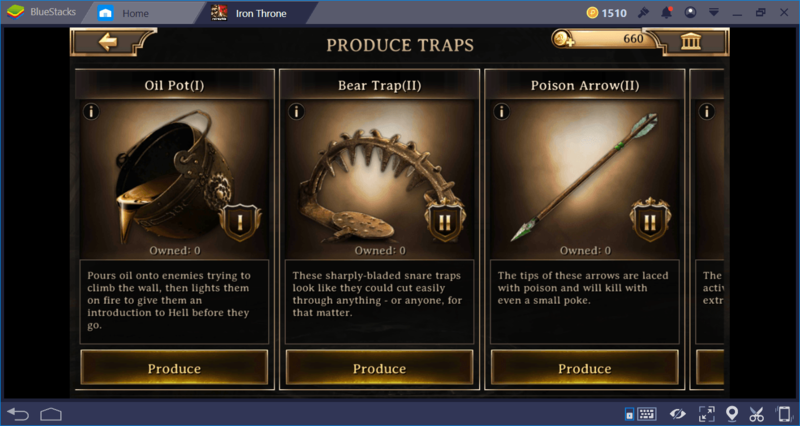 Iron Throne rewards players who pay attention to detail. You cannot win this game simply by setting up a large army. You have to make strategic decisions and build a balanced kingdom. Now you know the clues that will help you to do this: It’s time to put what you have learned into practice and sit on that throne. Good luck – do not forget to read our other Iron Throne guides!